The Singapore skyline has been getting greener these days with new developments from some of the world’s most renown architects. 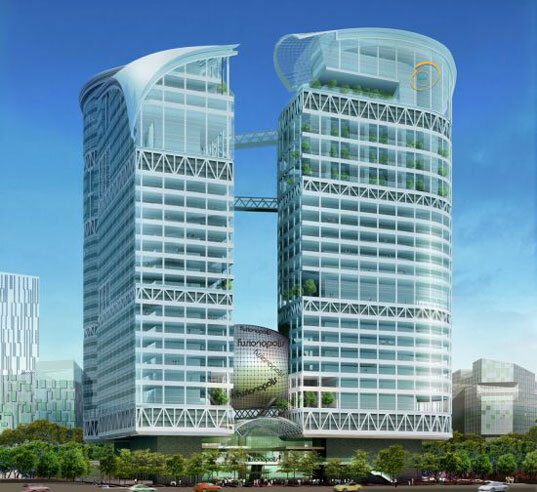 The latest design to join the trend is a new futuristic green building from architect Ken Yeang named Fusionopolis. A research and development complex, this structure will adorn Singapore as the island nation’s most eco-friendly skyscraper. The 15-story building will be 1.4 Km high, and boast of a ‘green infrastructure.’ The building will be home to the longest continuous vertical stretch of vegetation of any building in the world. A vertical spine of planting will rise up through the building, and landscaped garden terraces will be located on each floor of the building. The vegetation will help in passive cooling and insulation. The vegetation will also improve the sense of well being of the residents. Natural daylight will be directed into the building interior by prisms which deflect the sunlight as it hits them. The drainage and irrigation system will also integrated green features. The whole building will function as an ecosystem, and strive to strike a balance between the organic and inorganic elements so as to make the building work like a living system. The building has been designed by the visionary architect Ken Yeang. He is currently working as the director of Llewelyn Davies Yeang, a leading design and architect firm. He is well-known for developing environmentally sustainable buildings for the tropics and believes in the philosophy that buildings should work like living systems. I'm developing permaculture projects in the Philippines. Are there any green architecture firms in the Philippines? what is the name of this project? can i get the plans of it somewhere? 1.4 km is the length of the continuous green spiral ramp, not the height of the building. There is a typo in the article... 1.4 km is the length of the continuous green ramp, not the height of the building. We are too looking for similar kind Designs the build the Mixed development in Jaipur. Can you suggest me best architect who can handel project in India. What would be cost of Architect fee ? Please comment directly at [email protected] . I am bad with the metric system, but 1.4 km? At 15 stories, that would make every story about 300 feet, right? What am I missing here? Erm, you seem to have mixed in an image of Fusionpolis 1, which is by the late Kisho Kurokawa in with the post. This Fusionpolis is actually phase 2B, across the road from phase 1. The Singapore skyline has been getting greener these days with new developments from some of the world's most renown architects. 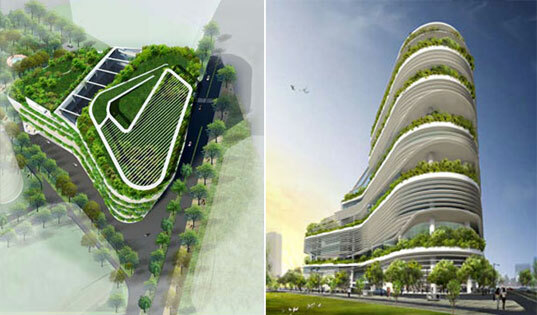 The latest design to join the trend is a new futuristic green building from architect Ken Yeang named Fusionopolis. A research and development complex, this structure will adorn Singapore as the island nation's most eco-friendly skyscraper.